A recent analysis by USA Today recently showed that airline fees have jumped almost 50 percent since a year ago. !! Yes, for reals. Not only do you have to pay for checked baggage, change fees, priority boarding, priority seating (like United‘s “Economy Plus” section), companies like Spirit Air charge for carry-on baggage, US Airways and Allegiant Air charge for booking a ticket by phone, and even Continental, Hawaiian, American and US Airways charge for issuing a receipt seven days after a flight is taken. Add in charging for meals, drinks, headphones, movies, and whatever else, and soon you’ll be buying your own jet and flying it yourself places. In total, the U.S. airline industry has made about $2.1 billion in revenue from fees alone, which could – I suppose – help its survival. The bigger issue that arises from this analysis is that the added fees makes it more difficult to comparison shop flights. This is less difficult if you’re like, say, me, who only carries-on and does not need to board before everyone because priority boarding doesn’t get you to your destination any faster – and since I’m not THAT tall, I don’t need extra legroom – so I haven’t contributed to the $2.1 billion revenue. But it is tempting – after all, what’s $10 here, $25 here? You’ll grumble, but you’ll then just let it go. Build it all together into one price, however, and you’ll see your $259 supersaver deal to Miami suddenly escalate to nearly $360. Make it a family of four, or a company department of 15, and you’ll have just added almost $100 extra per traveler. Anyway, there’s no real lesson to be learned here other than to be aware of what the total price of your ticket will be after you add all those additional bells and whistles. The search engines (like Kayak) haven’t quite caught on to adding buttons so you can search with the extra fees calculated into the total, partly because the fees keep changing. Oh, you’ve got to be kidding me. An Italian company, Aviointeriors, has invented a new airline seat that resembles a horse’s saddle. Known as the “Skyrider,” it’s been said to be the “least comfortable” seat but will provide about 40 percent more seating per plane, and airlines could charge less for such a seat. It’s also been described as a “bar stool” with a seatbelt. Perhaps riders of those seats will get drinks throughout the flight to help them forget what a terrible idea this ever was. (I was always a fan of Italian designers – until now). There are airlines who are interested, including Ryanair and China’s Spring Airlines. And why not? With the industry hurting, it will get people to fly. Ryanair says it would offer such seats for flights of 90 minutes or less. Truthfully, I suppose I could withstand a flying bar stool for 90 minutes, so thankfully Ryanair is thinking in that direction. But are other airlines going to do the same – or actually expect passengers to fly those cross-country? Maybe next we’ll just have rows of walls with belts, and we’ll just have standing room-only sections at the back of the plane. Getting Lost In: A Tanzanian Safari! There’s nothing quite as exotic as a safari, and even though there are about as many safari operators and companies as impalas out on the land, you’ll never grow tired of watching lions chomp noisily away on a baby gazelle, or the giraffes languidly wandering across the plains, or the zebras standing in striped formation facing off predators, or a vulture circling overhead waiting for the next meal to fall down dead. In Tanzania, the national parks in the northern part (Serengeti, Ngorongoro Crater, Lake Manyara, stretch for miles and kilometers into Kenya’s Masai Mara park (which is also enjoyable but only a quarter of the space that the Serengeti sees). Depending on the season, which is changing thanks to global warming, Masai Mara sometimes gets more wildebeast traffic than the Serengeti, which doesn’t mean you still can’t get your fair share of other wildlife sightings on the Tanzanian side. Here’s a Q&A format for How To Safari. Q: Safaris are expensive. How can I rent a car and find my way around? A: I thought about this, but decided it was easier to drop the $700 per person (which was the lowest price we found anywhere) than risk getting run over by a herd of buffalo. You’ll have to deal with a lot of paperwork, and finding your way around in Swahili, and what to do if your tire pops (which seemed to happen to every other Land Rover) or your car overheats and dies in the middle of the Serengeti. I would not really recommend it. However, if you must, there is someone who has written a book about it. Q: What should I expect for overnight accommodations? A: There are a huge range of accommodations, from luxury hotels to basic tents. You can also stay in a luxury tent, complete with electricity and down pillows, too, but still feel like you’re “camping” (if you want to fool yourself like that). We camped in a basic, non-luxury tent for two nights and one night in a lodge. 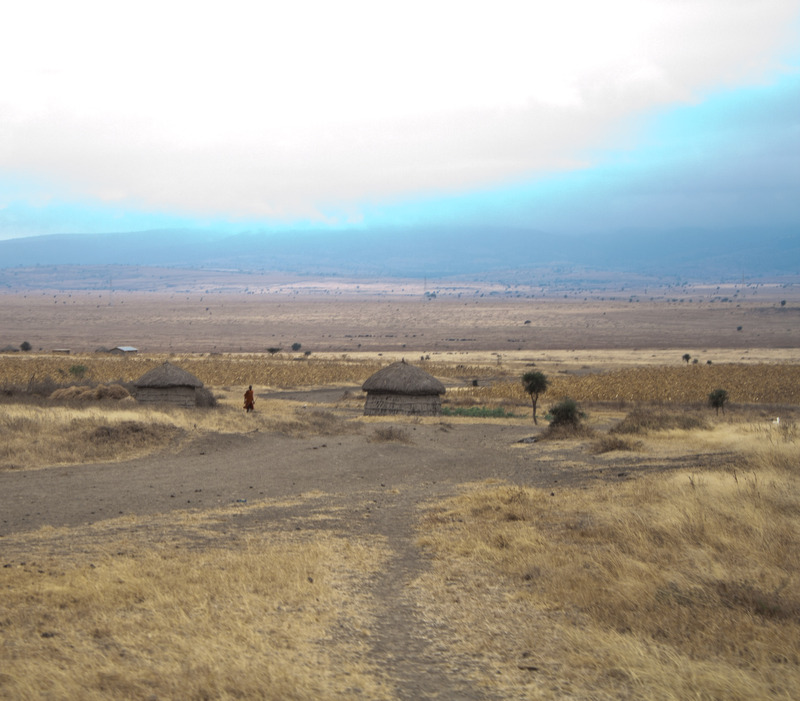 You will camp at a campsite in lion territory, and you can hear hyenas howling all night. There are other groups camping in the same place, and the lions won’t come near until everyone has gone into their tents. Once everyone is asleep, however, you will be warned by your guide to stay in the tent all night and to make sure you pee before going to bed. You’ll also have access to showers and all that. The other option is a basic lodge, which is a clean one-star room. Ours had an ensuite bathroom and clean sheets and was enough for our purposes. Whether you have warm water really depends on how much money you’re paying. Q: What comes in a safari package? A: All safari packages arrange for vehicle, driver, cook, accommodations and meals. Most will provide camping gear if camping, but you should double check. Most will also provide water. We had to rent sleeping bags, but they picked them up for us. A: You do not need to wear “safari gear” because you’ll just be sitting (or standing) around in a Land Rover all day. I love the desert-collection everyone was donning as if they were going hunting (hiking boots for no hiking, khaki cargo pants, khaki top, khaki cargo vest, khaki hat). The biggest worry is dust. You’ll be coated in plenty of it and breathing much of it in. Hats tend to blow off during the car ride. I would wear what’s comfortable and easy to hand-wash and dry (like a woven shirt rather than a knit), avoid white, wear sneakers so your toes don’t get really brown, have a sweatshirt for evening (or a fleece, except it will get a lot of dust embedded in it), and a bandana to cover your nose and mouth. Sunglasses also help keep dust out of your eyes. Q: What equipment should I bring? A: A good camera with a super zoom, preferably an SLR (I had 300mm and sometimes that wasn’t even enough! But don’t go changing your lenses mid-way or you’ll just keep inviting dust into your camera.) And binoculars! We had small ones for sports or the opera which sufficed. Lastly, a flashlight is very important unless you like blindly finding your way around the night in lion territory. I personally love the headlamp, so you can be hands-free. Q: What’s a good number of days for a safari? A: That depends on your budget, how much time you have, and how patient you are. For me, four days was plenty. I got my lion’s share (pun intended) of animals and was very happy. After a while, you stop asking your driver to pause for the zebras and giraffes because you’ve been there, done that. Some people will go for 10 days or longer, but they’ll return to the same sites to watch the same animals throughout the day, which is also an interesting study – a day in the life of a lion, or of a warthog, for example. You’ll also have more chance to view other animals. Q: How do you choose a safari company? A: There are so many safari companies and in the end, we all ended up at the same lodges/ campsites and saw the same animals. I heard some only permit a certain amount of miles, and others rely on the two-way radio to hear about animals. I personally do not have a problem with the two-way radio: you’re there to see exciting animals like lions, why not drive to where they are? The lions don’t care if you’re watching. In the end, you’ll get to go home having seen the Big Five while the others who were anti-touristy missed out. You can cut down the price of your safari if you can find extra people to join in your vehicle. The only way to really do this ahead of time is to search travel forums, such as on Frommers or Lonely Planet. Q: What company did you go with? Do you recommend it? A: We were recommended an individual named Pasian Peter, who seems to run his own company purely through word of mouth. He ended up being almost $200 less than all other budget safaris, and our guide Louis was really knowledgeable, friendly, and wanted to make sure we were happy and saw everything we were hoping to see. He would stop whenever we requested, and would drive extra if we wanted. Our cook made very big and delicious meals, and they pitched our tents, cleaned them, gave us snacks for the road, and bought us sodas and drinks. He does not have a Web site, but simply e-mail him and tell him you were sent on a recommendation. He will give you details and then you will wire a deposit. The rest you pay in cash, and I highly recommend bringing American dollars because the largest Tanzanian bill available is 10,000 shillings = $7. Pasian Peter (ppmoshi@gmail.com). Q: Maasai tour: worth it or not? A: Eh… we spent a week in a Maasai village beforehand as volunteers so we didn’t feel the need to visit the village where they were all fully dressed in ceremonial wear just to entertain tourists. But, it could be interesting to stop in, as long as you’re aware you’re being entertained and this is not how they normally spend their days. Or, perhaps they do spend their days just singing and dancing for tourists. If you have any other questions, always, feel free to send me an email! My Travel Hats back from hiatus! It’s been a very exciting month of August, filled with travels galore – from the Great Rift Valley to the San Fernando Valley, I’ve been galavanting around through northern and southern California to New York. Apologies for the lack of postings, but I will begin resuming after this Labor Day!